Fig. 1. Block diagram of the proposed DTS-SR framework. The key-frames are first uniformly sampled from the LR input video with an interval of frames. These LR key-frames are upscaled using TS-SR . Bicubic interpolation followed by BOBMC are then used to upscale and reconstruct the HR details of individual non-key-frames in between two successive key-frames. Finally, these upscaled HR frames are rendered using the proposed DTS-SR to maintain the temporal coherence. This paper addresses the problem of hallucinating the missing high-resolution (HR) details of a low-resolution (LR) video while maintaining the temporal coherence of the reconstructed HR details by using dynamic texture synthesis (DTS). Most existing multi-frame-based video super-resolution (SR) methods suffer from the problem of limited reconstructed visual quality due to inaccurate sub-pixel motion estimation between frames in a LR video. To achieve high-quality reconstruction of HR details for a LR video, we propose a texture-synthesis-based video SR method, as shown in Fig. 1, in which a novel DTS scheme is proposed to render the reconstructed HR details in a temporally coherent way, which effectively addresses the temporal incoherence problem caused by traditional texture synthesis based image SR methods. To further reduce the complexity of the proposed method, our method only performs the texture synthesis-based SR (TS-SR) on a set of key-frames, while the HR details of the remaining non-key-frames are simply predicted using the bi-directional overlapped block motion compensation. After all frames are upscaled, the proposed DTS-SR is applied to maintain the temporal coherence in the HR video. Experimental results demonstrate that the proposed method achieves significant subjective and objective visual quality improvement over state-of-the-art video SR methods. Fig. 2. Block diagram of proposed DTS-based refinement. Fig. 3. 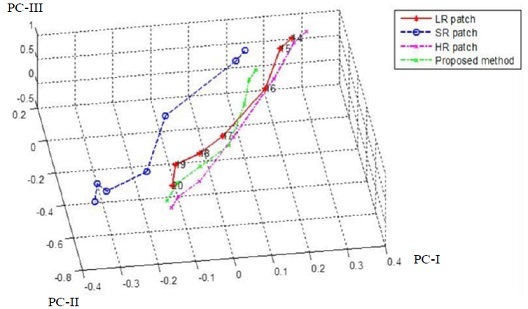 Examples of PCA low-dimensional trajectories projected from the ground-truth HR textural patches (red), its downscaled LR patches (pink), the HR patches upscaled from the LR patches via TS-SR+BOBMC (blue), and SR patches via the proposed DTS-SR method (green), respectively. Fig. 2 depicts the proposed DTS-based refinement scheme, in which both the input LR frames and the reconstructed HR frames obtained via hybrid TS-SR/BOBMC are used to derive temporally coherent HR video frames. Our method is based on the assumption that the content of a textural patch varies along time and the transition between the textures can be modeled as a linear or nonlinear system -, . Fig. 3 shows the four projected trajectories of the ground-truth HR patches, the downscaled LR patches, the SR patches via hybrid TS-SR/BOBMC, and the SR patches via the proposed DTS-SR method (i.e., hybrid TS-SR/BOBMC followed by DTS-based refinement), respectively. We can observe from Fig. 5 that the trajectory of the SR patches obtained via DST-SR is much closer to the ground-truth trajectory compared to that of the SR patches obtained via hybrid TS-SR/BOBMC. As a result, the proposed DTS-SR method can well address the temporal incoherence problem in video SR which can also be observed from the SR videos. See video demo pages to get more information. Fig. 4. Objective visual qualities evaluated by MOVIE for the eight reconstructed SR Videos with different interval lengths between two successive key-frames (KFs). Fig. 5. Run-time complexity (in seconds) comparison of the proposed SR method for the eight test videos with different interval lengths between two successive key-frames (KFs). Note, the selection of the number of non-key-frames between two successive key-frames will influence both the visual quality and computational complexity. Fig. 4 compares the visual qualities of reconstructed HR videos using our method with different values of for the eight test videos. Nevertheless, the computational complexity will be higher due to the increased number of key-frames as depicted in Fig. 5. In contrast, the MOVIE index increases with the value of K, leading to lower visual quality but also lower computational complexity. As a result, in our method, the value of can be adjusted to achieve a good tradeoff between visual quality and computational complexity. Table 1: Rum-Time (in Seconds) Comparisons among the Evaluated Methods Used for Comparisons and the Proposed Method. The proposed method was implemented in MATLAB 64-bit version with Windows 8.1 operation system on a personal computer equipped with Intel i7 processor and 32 GB memory. To evaluate the computational complexity of the proposed algorithm, the run-time of each compared method is listed in Table 1, which shows that the proposed method is significantly faster than ASDS-SR and TS-SR and comparable with SC-SR and BOBMC. E. M. Hung, R. L. de Queiroz, F. Brandi, K. F. de Oliveira, and D. Mukherjee, “Video super-resolution using codebooks derived from key-frames,” IEEE Trans. Circuits Syst. Video Technol. vol. 22, no. 9, pp. 1321–1331, Sept. 2012. Y. HaCohen, R. Fattal, and D. Lischinski, “Image upsampling via texture hallucination,” in Proc. IEEE Int. Conf. Comput. Photography, Cambridge, MA, USA, pp. 20−30, Mar. 2010.